1. How much credit are we supposed to give a movie for being self-aware? 22 Jump Street is so self-conscious and nervy about its status as an unnecessary cash-grab sequel that it never stops bringing it up. There are multiple inside-baseball asides about how much more expensive missions are the second time around, and how you're supposed to do everything the exact same way as last time, and so on—all sorts of winking nudges. (It even begins with a binging-on-Netflix-esque "Previously on 21 Jump Street" title card.) This is occasionally amusing and even clever—a running commentary on its own irrelevance. The question is whether that's enough. 2. 22 Jump Street seems to be receiving a lot of praise for standing outside of itself, distancing itself from its own badness, and I'm not sure that praise is earned. The meta-commentary idea is not new—I'm not sure it was new when Hope and Crosby did it—but the joke here seems driven more by laziness than anything particularly revolutionary. The unrelenting self-examination ultimately replaces the movie all together: You stop following the plot and instead just wait for someone to talk about what it's like to be in a movie. This all sounds more experimental than it is; it's a movie in absentia. Think Mystery Science Theater 3000, except there's no movie on the screen—just the mocking silhouettes at the bottom, yukking away. 3. 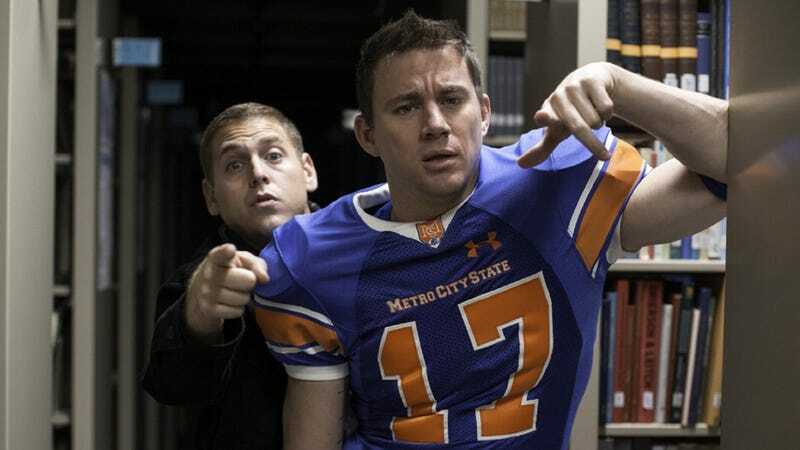 Thus, the basic structure of the first film—Schmidt (Jonah Hill) and Jenko (Channing Tatum) go undercover to infiltrate a drug ring—is repeated, almost to the letter, except this time it's in college rather than high school. The 2012 "original" wasn't cutting satire to any extent, but it did at least have a little bit to say about how much high school attitudes have changed, even in 10 years. (The gay kids are the popular kids now, and the jocks are all socially active, eating organic and worrying about the environment.) Whereas the sequel's take on college echoes Homer Simpson's. The ongoing joke is that Schmidt and Jenko are actually in love—that they're in a real relationship requiring counseling and time away from each other and breakup flings and all of it—which is a rather moldy conceit in this bro-heavy age. (I feel like three-quarters of the comedies I've watched in the last year are about that exact thing.) Surfacing so soon after Neighbors does 22 Jump Street no favors; that's a movie with a lot more to say about college and growing up, and has the added advantage of featuring a female character who doesn't exist solely to make out with Jonah Hill. 4. This film still has its moments, mostly because it's directed by the duo of Phil Lord and Christopher Miller, who made the very funny first film and have since exploded with The Lego Movie, which remains the highest-grossing movie of 2014. (You may also recall their late, lamented TV show Clone High.) Still, they're sort of working at half-speed here, offering more of a dashed-off experiment than a fully formed work, lacking in their trademark gentleness of spirit. 22 Jump Street coasts far on the goofy chemistry between Hill and Tatum; the latter is so good at subverting his dumb-guy schtick that I don't know if I'll ever believe him in an action movie again. We also get Ice Cube playing the angry father of an attractive college student, which made me feel as old as I've ever felt. (Ice Cube in the Archie Bunker role! Imagine!) There's also an extended closing credits sequence that pulls off the meta-joke better than anything that preceded it. 5. I'm not asking for high art here, but it's strange to see a movie garner so much praise for barely being a movie at all. 22 Jump Street is so embarrassed of its own existence that it lacks the conviction to actually do anything. Such self-mockery is fine and all, but it just feels wasteful. If you're going to go through all the trouble of making a movie, you might as well, you know, make one.